Both calls for action have challenged the military to identify creative ways to make the joint force a more effective deterrent given the emerging return of great power competition and the destabilizing actions of non-peer threats. To answer this question, we begin by acknowledging military power and strategic effectiveness are distinct concepts. While the military is definitely influential, winning military battles does not necessarily lead to achieving desired endstates. The military is not the sole solution to the security challenges faced by the U.S. on a global scale, but it is critical if there is to be any chance at deterring the threats currently faced by the U.S. and its allies. The U.S. faced a similar problem in 1976 when Former Counselor to the President and Secretary of the Army John Marsh and a newly appointed Secretary of Defense Donald Rumsfeld assessed the need to rebuild, restructure, and recapitalize the U.S. military after the withdrawal from Vietnam. They orchestrated a series of briefings to members of Congress known as the Hughes-Currie briefings. These briefings were named after John Hughes, the Deputy Director of the Defense Intelligence Agency, widely recognized for his nationally televised briefing during the Cuban Missile Crisis, and Dr. John Currie, the Under Secretary of Defense for Research and Engineering. Dr. Currie was responsible for initiating programs such as the global positioning system, stealth weapons, cruise missiles, the F-18, the M-1 tank, and early smart weapons forming the foundation of what is now called the Second Offset. These briefings identified the Soviet Union as the sole strategic threat to the United States accompanied by a number of persistent challenges. Today there are more, including the emergence of two revisionist near peers (Russia and China) and three destabilizing threats (North Korea, Iran, and Violent Extremist Organizations) instead of a single peer competitor. Several of these nations are determined to change the rules-based international order and create a multi-polar world that challenges the United States’ dominant position. Each of these revisionist powers is accumulating military capability at different rates, scales, and varying levels of sophistication designed to modify the rules-based international order, thus undermining regional prosperity and security. China in particular has signaled its clear intention to continue modernizing and expanding its armed forces, with the goal of completing modernization by 2035 and achieving a “world-class military by 2050 that can fight and win wars across all theaters,” as delivered by President Xi Jinping at China’s 19th Communist Party Congress. The other intriguing aspect of the Hughes-Currie briefings are how the persistent challenges are not only still prevalent but more interrelated across multiple domains. This was also made evident at numerous briefings and engagements where participants at U.S. Pacific Command events were asked for their views on the most dangerous security challenges, and the results echoed the original Hughes-Currie list. Cyber, however, was the only new challenge mentioned routinely. Since World War II, the rules-based international order, or what former Assistant Secretary of State Danny Russel coined as the “global operating system,” has kept the Indo-Pacific largely peaceful and created the stability necessary for economic prosperity in the U.S. and countries throughout the region. The collective respect for and adherence to international rules and standards have produced the longest era of peace and prosperity in modern times. These conditions are made possible by a security order underwritten by seven decades of robust and persistent U.S. military presence and credible combat power, reinforced by America’s security alliances, and further bolstered by its growing partnerships. To deal with the complexity of these challenges and the need to integrate all the various elements of national power, forward-based and rotational joint forces are the most credible signal of commitment the U.S. can provide. While the United States military is the most formidable on the planet, its adversaries operate beyond physical battlegrounds. The Third Offset is intended to asymmetrically compensate for the disadvantages the United States and its allies are now facing. As Former Deputy Secretary of Defense Bob Work stated on several occasions: “The Third-Offset is not about technology as much as the operational concepts and organization constructs that will shape the way we integrate and use the technology.” The U.S. needs to deploy an integrated joint force capable of responding rapidly to seize the initiative, control the narrative, and reestablish order regardless of the threat or situation posed by its adversaries. U.S. Pacific Command—indeed, each of the U.S. combatant commands—must have the ability to scale-up and sustain joint forces. The integrated joint force accomplishes this efficiently and effectively by integrating Pacific Command’s warfighting component capabilities into a forward-deployed fighting force beyond the International Date Line. Ideally, this would be a force ready to fight tonight and systematically apply and integrate asymmetric advantages and emerging capabilities. These capabilities include forward positioning theater infrastructure capabilities and the use of prepositioned equipment and supplies. An integrated joint force also requires a force posture that prepositions expeditionary capability, supported by dynamic basing and a level of partnering with other agencies and coalition forces not yet achieved. U.S. capabilities such as special operations forces; anti-submarine warfare; air and space superiority; land forces equipped with weapon systems to hold an adversary’s air, sea, and land forces at risk; cyber teams; and unique intelligence, surveillance, and reconnaissance capabilities are critical to this posture. There are others who suggest the U.S. can provide the necessary military deterrent via offshore balancing, which recommends the United States calibrate its military posture. At its core, offshore balancing envisions reducing America’s overseas military deployments and alliance commitments and shifting toward greater restraint in U.S. foreign policy writ large. Offshore balancing is based on the seemingly counterintuitive idea this type of retrenchment will produce better security outcomes at a decreased price. However, offshore balancing demonstrates a lack of understanding the military obstacles involved in the Pacific theater, not to mention historical fact. Offshore balancing, taken to its extreme, places the U.S. at a distinct disadvantage. Operationally, the U.S. assumes significant risk based specifically on the vast distances and time required to adequately reinforce units and fulfill treaty obligations during a full-scale contingency. Indeed, retrenchment has proved costlier than sustained engagement. It also underestimates the difficulty of restoring a forward-based deterrent once it has been dismantled, leaving the U.S. with only the options of regaining access or assenting to some revisionist or revanchist fait accompli. This is an inconvenient truth for offshore balancers that has presented itself during the past 100 years in Europe and East Asia, including the world wars and the Persian Gulf before 1990. The result was a high-intensity conflict to repair a regional equilibrium that had either broken entirely or was in imminent danger of breaking. Perhaps the wiser and more economical choice would have been to accept the peacetime commitments that might have sustained the balance and prevented the situation from reaching such a critical and costly juncture. Following Korea and Berlin in East Asia and Europe respectively, it was precisely this hard-earned awareness that rejecting onshore commitments was penny-wise but pound-foolish. The rules based international order has been very successful in preventing world conflicts on the scale of World War I or II and provided for unparalleled peace and prosperity. In 1949, President Truman stated that more than half the world’s population lived below the extreme poverty line. Today, according to the World Bank, that number is less than 10% and more than one billion of those people have been elevated in the last 25 years. Offshore balancing also takes for granted that, left to their own devices, U.S. allies will always choose strategies aligned with American interests. For more than two hundred years and with few exceptions, the U.S. military’s training systems, weapons development, and procurement have been focused on a single service’s primary domain of warfare. This becomes a problem when cross-domain integration incorporating space, cyber, and the electromagnetic spectrum currently occurs at the highest echelons of command and control—typically three-star operations centers, three-star joint task forces, or, for special missions, when all the cross-domain effects are brought to bear at a particular place and time. Operating an integrated joint force does not mean abandoning service-specific roles and responsibilities. To the contrary, efficiency requires clear delineation as well as interoperability and interdependence. The integrated joint force must have complementary and resilient capabilities that pose multiple dilemmas to the enemy in real time without delay—compared to creating an ad-hoc joint task force when a crisis occurs. An integrated joint force would likely be a catalyst to move the U.S. beyond the hub and spoke model its bilateral security agreements provide with allies and partners, and instead move the U.S. towards multilateral and coalition frameworks. These new frameworks would focus on interoperability, which allows for coalition forces to join an integrated joint force seamlessly. While potential adversaries develop counters to limit freedom of U.S. and allied action in the sea, air, space, land, and cyber domains—what many refer to as anti-access, area-denial (A2AD) capabilities—the U.S. Army and Marine Corps are developing Multi-Domain Battle as the next concept evolution in U.S. warfighting. Imagine an F-35 acquires a target at sea—an enemy ship—and then passes the track data through a command and control system (e.g., Link-16) to any potential military unit with appropriate munitions and within range of the enemy ship. This information is passed through a gateway to the Joint Range Extension Applications Protocol enabling the transmission of tactical data messages long distances via the Internet using the Battlefield Airborne Communications Node in a U.S. Air Force Global Hawk. This tracking data can then be passed to several potential military units on land, air, or sea such as the Paladin artillery system or the High-Mobility Artillery Rocket System (HIMARS). 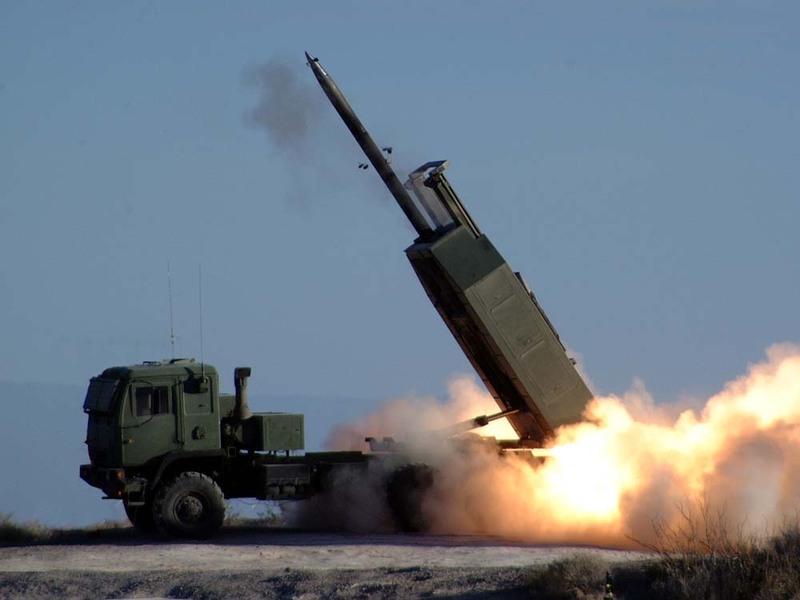 The Paladin or HIMARS then kills that enemy ship from the land. To summarize, this is a Navy fighter communicating through an Air Force unmanned aerial vehicle with an Army or Marine ground-based weapon system to kill a sea-based target—and for the most part this can be done today, with small improvements to the technological communication links between the services. In fact, this past October, a detachment of U.S. Marines from Camp Pendleton, participating in exercise Dawn Blitz off southern California, successfully destroyed an adversary air defense target using a HIMARS from the flight deck of an amphibious transport ship 70 kilometers away. This is only one scenario to demonstrate how Multi-Domain Battle can empower the joint force to focus on simultaneous and sequential operations throughout the depth of the battlefield. This also creates the conditions for windows of superiority to seize, retain, and exploit the initiative against an adversary by emphasizing maneuver and power projection over multiple domains and distributed battle spaces. Multi-Domain Battle provides U.S. Pacific Command and other combatant commands an operational concept executed in real-time from the strategic to the operational and tactical levels for planning, command, and execution. This includes communicating and coordinating directly across the domain-centric warfighting components and achieving a new level of decentralization and dynamism. A U.S. and coalition force jointly integrated and regularly demonstrating operations across multiple domains presents new challenges and multiple dilemmas for potential adversaries. These advantages, when integrated globally across combatant commands, will provide a more lethal, joint force that can present multiple, simultaneous dilemmas with little delay. Similar to what the Second Offset accomplished in the 1970s, Third Offset technologies such as big data analytics, artificial intelligence, and cognitive comput are essential to improving decision-making. Massive amounts of data that can only be properly analyzed and collated with the help of machine learning are now vital to the pace of modern warfare. Thus, Multi-Domain Battle introduces a level of complexity to the joint force that cannot be underestimated or undervalued. Transitioning to Multi-Domain Battle will be difficult and requires new methods for training and equipping the joint force. Achieving this level of decentralization will require new command and control architectures and approaches to developing the potential in junior leaders to create capacity for independent action when isolated from coordinated command direction. More importantly, investments in education and talent management focused on critical thinking must be staunchly defended in an era of shrinking resources. The joint force supported by Second Offset technologies ensured U.S. military preeminence in the post-Vietnam era well into the 21st century. By moving to the deployment of an integrated joint force using Multi-Domain Battle as an operational concept, the United States can provide like-minded nations the opportunity to become truly interoperable, and, when necessary, seamlessly transition from the most effective deterrent to a lethal and agile military force capable of defeating any adversary. The integrated joint force represents a pragmatic and economically viable approach to providing a lethal deterrent to any adversary (state or non-state) seeking to change the global operating system. Rather than attempting to match opponents man for man, ship for ship, or fighter for fighter, the U.S. is deliberately changing the competition to a more favorable footing by focusing on its collective advantages in technology, innovation, human resource development, and a broad network of regional alliances and partnerships to become truly interoperable. Admiral Harry Harris is the Commander of U.S. Pacific Command, the largest and oldest Global Combatant Command. He previously served as the Commander of the Pacific Fleet and has attended Harvard, Oxford, and Georgetown Universities. General Robert B. Brown commands the United States Army's largest service component command, U.S. Army Pacific. The command is headquartered at Fort Shafter, Hawaii with portions of the command-forward deployed and based throughout the Indo-Pacific region. Admiral Scott H. Swift commands the United States Pacific Fleet at Pearl Harbor, Hawaii. Prior to taking command of the U.S. Pacific Fleet, Admiral Swift commanded the 7th Fleet in Yokosuka, Japan. Dr. Richard Berry is Special Assistant to the Commander, U.S. Pacific Command for Global Engagement and Initiatives, and holds a Doctorate in Organizational Studies from George Washington University. General Martin Dempsey, “Building the Joint Force 2020” (presentation, Association of the Air Force, Gaylord National Resort and Convention Center, National Harbor, Maryland, September 19, 2012). Colin Clark, “CJCS Dunford Calls For Strategic Shifts; ‘At Peace Or At War Is Insufficient,’” Breaking Defense, September 21, 2016. https://breakingdefense.com/2016/09/cjcs-dunford-calls-for-strategic-shifts-at-peace-or-at-war-is-insufficient. Donald Rumsfeld, Known and Unknown: A Memoir. Sentinel Press, Penguin Books, 2011, Chapter 5. John Hayward, “Chinese President Xi Jinping Vows to Build ‘World-Class Military’ by 2050, Breitbart News , October 14, 2017. http://www.breitbart.com/national-security/2017/10/18/chinese-president-xi-jinping-vows-build-world-class-military-2050/. Admiral Harry Harris, “Statement of Admiral Harry B. Harris Jr., U.S. Navy Commander, U.S. Pacific Command before the House Armed Services Committee on U.S. Pacific Command Posture," 26 April 2017. Gabi Siboni and David Siman-Tov, "Cyberspace Extortion: North Korea versus the United States," INSS Insight No. 646, December 23, 2014. Mr. Robert Work, “The Third Off-Set” (remarks given, Association of the United States Army Annual Convention, Washington D.C., October 4, 2016). Barry R. Posen, Restraint: A New Foundation for U.S. Grand Strategy. Cornell University: 2014. John Mearsheimer, “A Return to Off-Shore Balancing," Newsweek, December 30, 2008. http://www.newsweek.com/return-offshore-balancing-82925. Liebe, Robert J., Retreat and its Consequences: American Foreign Policy and the Problem of World Order (Cambridge University Press: September, 2016). Brands, Hal, The Limits of Offshore Balancing. U.S. Army War College: September, 2015. Cohen, Eliot A., The Big Stick: The Limits of Soft Power and the Necessity of Military Force. Basic Books, 2018. Sean Lavelle, “The Economics of Conventional Deterrence in Europe,” The Strategy Bridge, 13 Oct 2016, https://thestrategybridge.org/the-bridge/2016/10/13/the-economics-of-conventional-deterrence-in-europe. Admiral Harry Harris, “Role of Land Forces In Ensuring Access To Shared Domains,” (remarks given at the Association of the United States Army Institute of War, Land Pacific Forces Conference, Honolulu, Hawaii, May 25, 2016). Gidget Fuentes, “Marines Fire HIMARS from Ship in Sea Control Experiment with Navy,” USNI News, October 24, 2017. https://news.usni.org/2017/10/24/marines-fire-himars-ship-sea-control-experiment-navy.